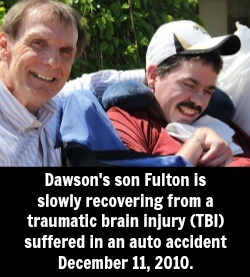 Dawson’s 25 year old son Fulton was involved in a serious traffic accident on Saturday. He suffered severe head trauma and is in a coma. The doctors said their #1 job is to reduce the life threatening swelling on his brain. They have listed his chances of survival as 60/40, but indicate that the longer he survives the better his chances become. Please pray for Fulton, for Dawson, for their entire family. Please feel free to share this with all those you know who would be willing to pray. 1. The ONLY source of real hope in times of trouble is to bring our burdens to God in prayer, trusting that God is good and in control of everything. [Tweet This!] Putting my hope in doctors or in Fulton or in the next therapy or in myself has always left me empty. Putting my hope in God’s love and provision fills me with peace. I went to the studio Sunday night, put on my headphones and took calls from teenagers and young adults like I have for every week for 20 years. Do I have moments of fear and anxiety? Of course, but these moments have been dwarfed by my confidence that God is sovereign and in full control. How is it that I could stay calm and strong? Your prayers! We have no place to go but to trust God and persevere with His merciful help. 2. Spill your heart out to God in prayer¦even when you’re angry. [Tweet This!] He already knows your heart and is merciful. I often found myself crying out to God in anger and with big questions, like Why me?! ?God always mercifully directed me back to His goodness and love. A year has passed, and as I thought back to that awful morning a year ago, I burst into tears and sobbed uncontrollably. I wish I could tell you they were tears of joy or hope or even of thankfulness for the progress Fulton has made, but they were not. Instead they were tears of anger, resentment, and fear. I even regressed further and asked the most basic plea of all, “God, why me?” The simple answer to that plea is, why not me? God owes us nothing but judgment. Sometimes people come up to me and tell me how amazed they are at how strong we have been. This is very kind of them to say but they don’t realize the many failures along the way. So, after regaining my composure, I confessed to God my ungratefulness and lack of faith. He comforted me and soon I was dressed and ready to go work with my son at the rehab center. We had a great day together. I hope you are having a great day. Got to hang on to the good ones and reinterpret the ones that aren’t. This heartache with Fulton has taught me many things. For example, it is easy to really get angry at God for what has happened. I always thought I would grow past this blatant show of self-centeredness and faithlessness, but sometimes I don’t. I am trying to find practical ways to get past this stumbling block because to stay angry at God puts me in a very dark place. 3. Offer prayers of Thanksgiving in the midst of your struggles. [Tweet This!] I have learned to shift my focus off of my problems and onto my blessings, and this has made all the difference. Giving thanks and praising God wipes away the tears of hurt, anger, and heartache. Sometimes I don’t want to thank God; I just want to stay stuck in my rage. But what a gracious God we have, who delivers us from the dark times and puts thankfulness in our hearts. It can be difficult, to say the least, watching Fulton suffer day in and day out. It is easy to look on the dark side of the situation and become depressed and withdrawn. This is not what God would have us do. I received a message on the wall of my Facebook page from a woman who heard about Fulton’s tragedy. She wrote: “In the end, everything will be ok. If it’s not ok, then it’s not the end! Chin up Dawson! You have a whole lot to be thankful for, you can still tell your son ‘I love you’, you can still watch him breathe while he sleeps, you can still see his face every day, etc. You have a miracle already happening right in front of you! EVERYTHING happens for a reason!” Her post really spoke to me. There is so much to be thankful for in this crisis. God is at work in ways we will never understand, but He is doing some wonderful things all around us. I don’t know what you are going through, but I can assure you God is in the middle of it doing wonderful things you can’t even see. 4. God hears everyone’s prayers “ Not just the superChristians. [Tweet This!] So many people have prayed for Fulton. It is humbling. Doctors have kneeled beside his bed, nurses & therapists have prayed with me for Fulton. I’ve received countless e-mails from teens and young adults who listen to my radio show saying they are praying. All their prayers have the same power to the ears of God! Several youth groups came last week to the nursing home to hear our story and meet Fulton. It was very moving as we wheeled him out in front of the audience. After the meeting, my son was taken back to his room and put to bed. Two older teenage guys approached me and asked if they could go back to Fulton’s room to pray for him. These guys were pretty rough characters, but so what? They wanted to pray for my son. One of the boys prayed quietly, the other prayed out loud. It was one of the most loving prayers I have ever witnessed. As he prayed for Fulton he patted him on the shoulder and neck to show his love and respect for him. Later I found out these young guys had only been Christians for two weeks. I got to thinking how love never fails and God heard their prayers as much as the greatest Theologian who ever lived. It was a moment I will never forget. 5. Surround yourself with people who will pray for you. [Tweet This! ]Without a doubt, God has responded to the prayers of thousands of people who have prayed for Fulton. Their prayers have been a source of comfort, strength and healing. Crunch time comes in the middle of a crisis and only the strong survive. By strong, I mean those who are prayed for, encouraged by God’s Word, and have strong people around them. My son hasn’t stood up in seven months. He has either been in bed or in a wheel chair. Recently the staff at the nursing home announced that they were going to help Fulton stand. The rehab people use what they call a “standing table.” As I watched him positioned at the standing table, I noticed something else – It took five people to help hold him in place to support him. It was quite a sight to see. Then I got to thinking, “God wants us to stand… but not alone.” Even when we can’t support ourselves in our life’s struggles, He will hold us up and send people to help us stand. At an event this week, several people came to me wanting to know all about Fulton. I was amazed at many of them who assured me they were praying for Fulton on a daily basis. I was so encouraged. Think of the thousands of prayers offered up for Fulton. It has and will make a significant difference in his life. Many people relayed to me their belief that Fulton will slowly but surely continue to heal. I believe them. Not only because I see it, but also these people have been with God, and God has spoken to them as they cry out for healing. That’s what powerful prayer is all about: great perseverance, asking and believing God will do miracles, even while listening to His response. I hope you will get to experience the tremendous encouragement from those who daily pray for you and listen to God for His response. There’s nothing quite like it. In no way has our family had to face this ordeal alone. So many people have sent messages assuring me of their prayer and support. One woman in particular deeply touched me when she wrote, I heard about Fulton on the radio and I immediately pulled off the road to pray for him.What a beautiful picture of love; one woman in her car on the side of the road praying. No one driving by that night knew what she was doing, but God certainly did. And He answered her prayer. ***If you have not experienced the power of people praying for you, please go to ThePrayerZone right now and ask for prayers. You are NOT alone. 6. Don’t give up. Pray continually even when change isn’t obvious. [Tweet This!] I continue to learn the hard lesson of waiting on the Lordand continuing to pray as He teaches me patience in His timing. It was then I realized I was having a patience problem. As good as God has been to my family and me, I wanted Him to do more and I wanted it then. In fact, I wanted everything on my time table. God made it clear to me I was failing the ‘wait on God’ test. It’s hard to wait on the Lord because when we do, we are saying we have no control over the situation. All we can do is pray and wait. That in itself takes courage and faith. I believe my son will talk again. But rest assured when he does, it will be on God’s timing – not mine, and it will be the best time ever. It will be on God’s clock. I am finding that Fulton’s very slow recovery has exposed gaps in my thinking. For example, there is the saying, pray until something happens.It is a Biblical thought. To me it means never give up…you pray and fight, believing God is at work and will bring whatever miracles you need, which in my case is Fulton’s healing. I think God does not want us to be satisfied with the broken things of this world. He wants us to do all we can to repair and redeem broken things wherever we find them. But in the midst of our struggle to do this, he patiently calls us to trust him “ to be so confident in his loving faithfulness that we are at peace with what he gives or allows each day. So how do we reconcile our struggles with God’s trustworthiness? How do we come to this peace? Only one way; PRAYER. God says pray militantly, and He will give us peace. Put another way, do what God says and rest in it. Let God deal with the space between hope and reality. I trust all is well with you today. I was thinking the other day about what has impressed me the most during this long journey: It’s the continual, consistent, persevering prayers you have offered up for my son. Which begs the question: as beautiful as those prayers are, have they been answered? Not all (yet), but many more than I first imagined. Fulton is alive after being three times on the edge of death. His mind seems to be getting sharper every day. He has the patience to endure frustrating moments along the way. He has touched more lives than one could ever imagine. He is loved wherever he goes. His love for God is obvious. All of these answered prayers are just the tip of the iceberg. But God has made it clear; He has answered those many persevering prayers. 7. Prayer brings victory. [Tweet This!] Sometimes those victories are small and sometimes they are huge, but they are always there. Here are a few of the many miracles I have been privileged to witness along the way. Six months have passed since Fulton’s accident. And this week was good. A friend of mine was teaching Fulton how to kick-box from his wheelchair. I was so excited that I went and found one of the main nurses to come watch. While we were watching him kick away, he suddenly broke into a full-fledged smile. The smile was not contorted in any way and looked completely natural. We were astounded and our eyes filled with tears. We could not deny what we had just witnessed. I turned to my friend and said “Did you see him smile? It’s a miracle! Fulton has a smile on his face most of the time and appears to be happy. I happened to mention to my wife that Fulton is happier now than he has ever been. Even though my son has serious handicaps, he has learned how to be content. God has given him a sense of peace and a deep contentment about his circumstances. To have God’s contentment and peace is priceless, but not always easy to come by. There are millions of people who physically are in much better shape than Fulton, but they have no contentment or peace. This happiness is from God. Your prayers have saved my son’s life. Three days ago he had a fever of 104 degrees, pneumonia in both lungs and was put on a ventilator to survive. I will never forget the fear and panic I saw in his face because he could not breathe. But God, in His great mercy, saved Fulton yet again. His temperature is back to normal and he is scheduled to come off of the ventilator today. Although he is still in the ICU, he has come a long way from where he was Tuesday night. Thank you for loving Fulton through your prayers. Fulton is still growing. He continues to be more alert, stronger, and winning the battle against depression. He’s obviously at another level from where he was. Your prayers have meant so much to him and all of us. I said to him the other day, Son, I am not exaggerating when I say at least a hundred thousand people worldwide have prayed for you, and that is why God is healing you one cell at a time.He, with a big smile on his face, gave me a huge thumbs up. He knows without your prayers he would have been gone a long time ago. He has the comfort of experiencing the power of other people’s prayers. Praise God that Fulton experienced a breakthrough this last week. 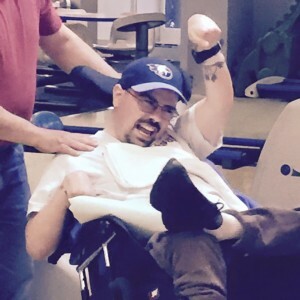 The right side of his body has been paralyzed since the accident. From time to time he would move his right foot slightly. But for the last two and a half years it has been dormant. Last week my friend Randy and I were with Fulton challenging him to lift that leg. He did it in front of our very eyes. He lifted it higher than he ever has. It was a beautiful thing to watch. 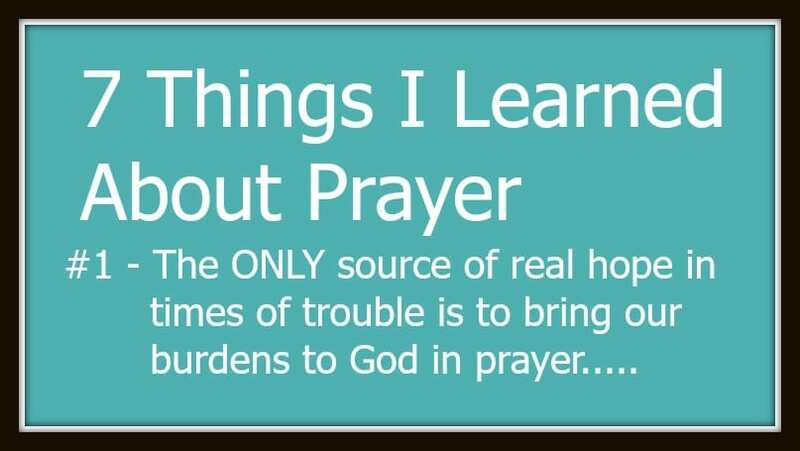 So there you have it¦7 things I learned about prayer. Nothing else has the same power as persevering, intercessory prayer. Fulton is still showing signs of healing. I would never have thought it would take so long, but God has His own agenda in teaching us to be patient. He has proved His faithfulness to us one day at a time, and in some cases, even one minute at a time. And so, armed with prayer, we press on, one victory to another. If you have never had someone pray for you before, please give it a try. I have prayer champions waiting to pray for you too. You can ask for prayers right now at ThePrayerZone.